With swirling patterns, all-glass facades, and intricate woodwork, these luxury homes know how to give a good first impression. A front door offers more than just an entry into your home — it’s a space that lets your personality shine. 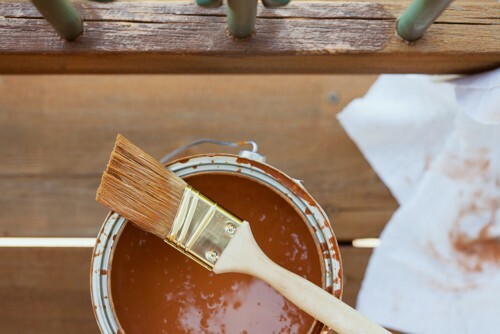 We know it sounds cheesy, but think of it this way: It’s a feature that can completely change the feel of a home’s exterior with little more than a bold coat of paint. Yet so many of us are content with the “sensible” choice, which is usually a subtle, neutral door that’s barely distinguishable from the curb. Want to give your home a hint of the beauty within? Start with your entryway. 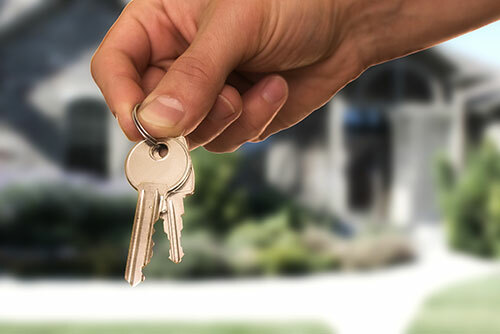 And if you’re seeking inspiration, from impressive sculptures guarding entryways in homes for sale in Greensboro, NC to covered bridges in homes for sale in New Hope, PA, these luxury homes make a big first impression. 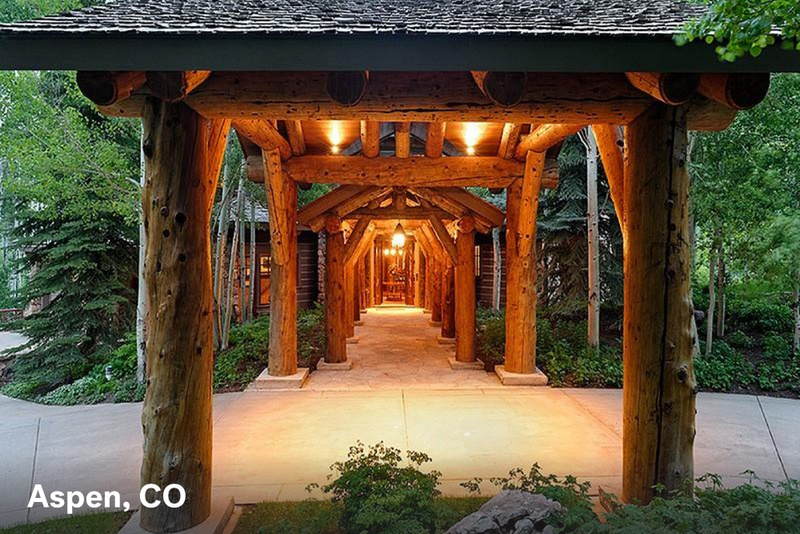 A majestic “tunnel” of rugged logs defines the entrance to this jaw-dropping mountain estate. The woodsy feel extends to the entirety of the (enormous!) 10,761-square-foot home, built with timber from Yellowstone National Park and custom-cut Colorado sandstone. Although the interior is grand (the listing suggests that the six-bedroom home could be used as a corporate retreat), the design feels comfortably cozy. Venture outside to the private elevated overlook point to bask in a breathtaking vista of the magnificent Mount Hayden. Although we often think of the Victorian era as a time of stodgy attitudes, it was a period when over-the-top details ruled. 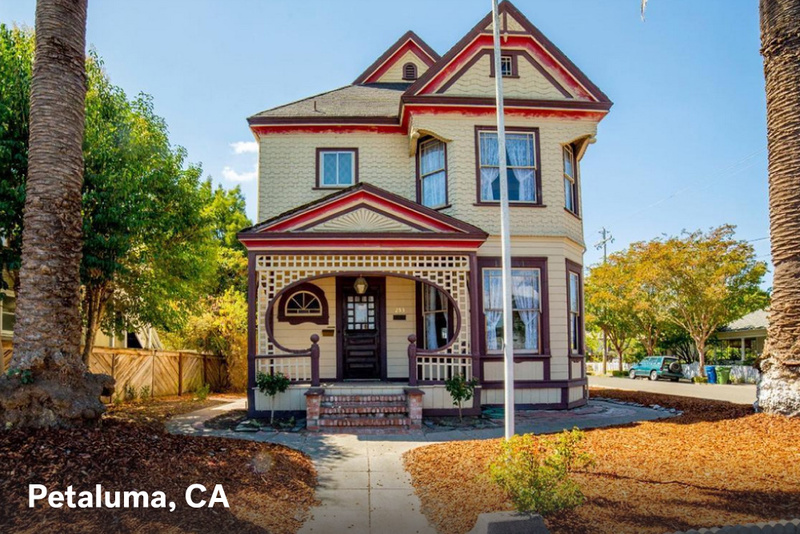 To wit: this Queen Anne Victorian, which dates back to the 1890s and looks like something you’d find in an old storybook. We particularly love the eccentrically curved entry of the lattice-fronted porch, which beautifully frames the glass-and-wood front door and fanlight-style accent window. This structure also protects the exterior pendant light (a detail you don’t see too often these days). Walk into this gracious home to find even more authentic period charm. There’s lacelike woodwork, intricately carved mantel surrounds, fine wainscoting, and plank-style floors, all in a rich dark finish that works perfectly with the ornate wallpapers. 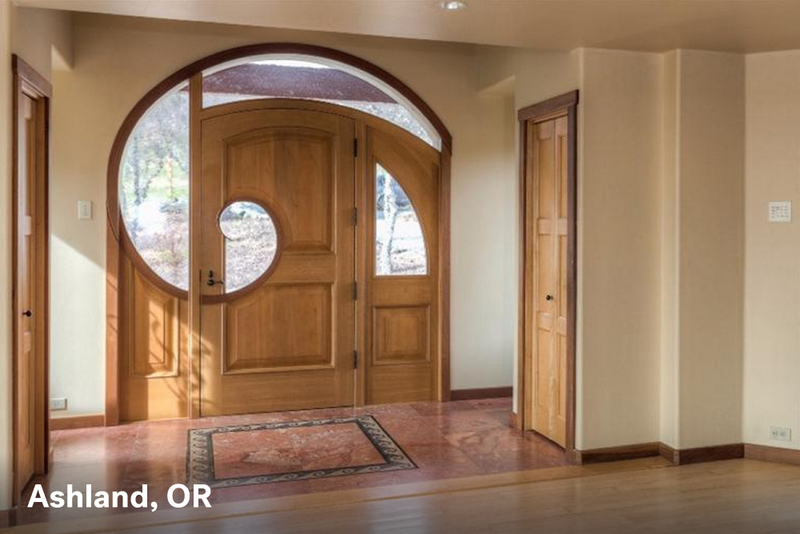 Of course you’ll find handcrafted doors in Portland, OR, the capital of all things artisanal. The artful wood entry features sculpted dimensional forms and an intriguing distressed finish. It’s a handsome complement to the rest of the home, which was once the private residence of notable developer and architect Saul Zaik. Originally built in the 1950s, the Mid-Century Modern stunner has been carefully expanded and renovated from the studs out, bringing in new features such as the vaulted ceilings and a gourmet kitchen. Handsome wood envelops the interior surfaces, creating a cocoonlike effect as you enjoy panoramic views of downtown Portland from the expansive windows throughout the home. If you need more proof that an entry can set the tone for a home, look no further than the elegantly illuminated covered bridge that takes you to the front door of CrossBow, a truly one-of-a-kind estate in equally quirky New Hope, PA. Suspended over a small pond, this feature is a nod to the many historic covered bridges found in the region. Previously owned by an author and world-famous sculptor, the house has unique details galore: stained-glass windows, floors studded with antique nailheads, and cabinetry made of heat-patina copper. Huge windows offer views across the wooded 10-acre estate (which includes secret trails), along with nearby Buckingham Mountain, which can be viewed from the comfort of the hot tub on the back patio. 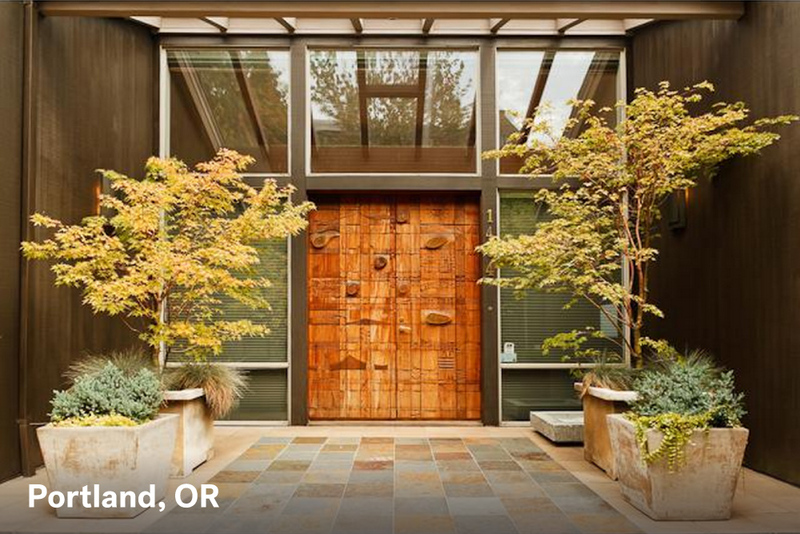 You’ve probably seen front doors accented by window panels, but you’ve never seen one like this before. Here, a wavelike swirl of glass is integrated within and around the door, drawing the eye around the entryway. This remarkable custom feature hints at the incredible details found throughout this 6,053-square-foot mahogany-and-rock-sided home. There are rare quartz countertops, mahogany-and-lace wood cabinets, and geothermal radiant floors of bamboo, tile, and travertine. The Cascade and Siskiyou mountain ranges provide a stunning backdrop to this thoughtfully designed home. 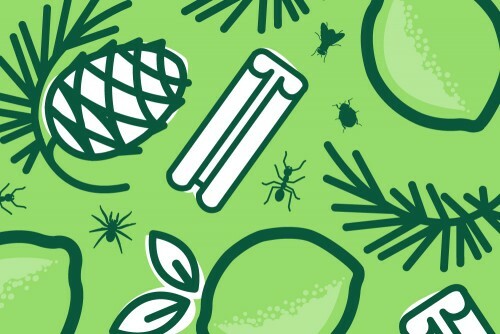 Tree-huggers rejoice! An exquisite sculpted canopy of trees takes this sprawling 10,815-square-foot contemporary interpretation of a Georgian-style mansion to a whole new level. 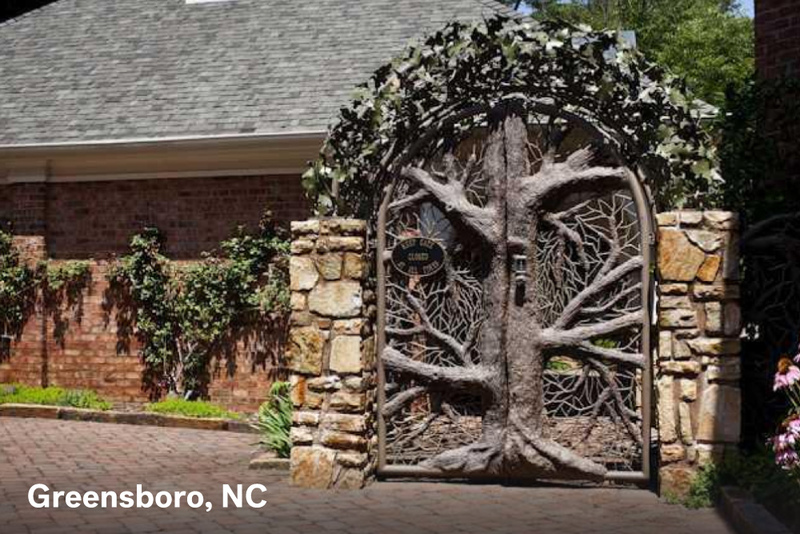 This statement piece was made by sculptor Jim Gallucci, who also lent his talents to the home’s impressive gates, handrails, and fences, which draw inspiration from the organic beauty of branches and trees. 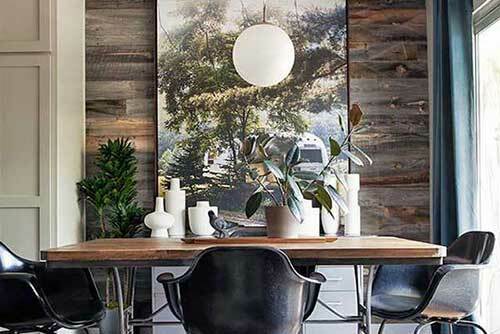 The nature theme truly becomes apparent in the home’s interior, where you’ll find rough-hewn wood planks, impressive murals, stone walls, and detailed entryway “columns” that take the form of gnarled trees. 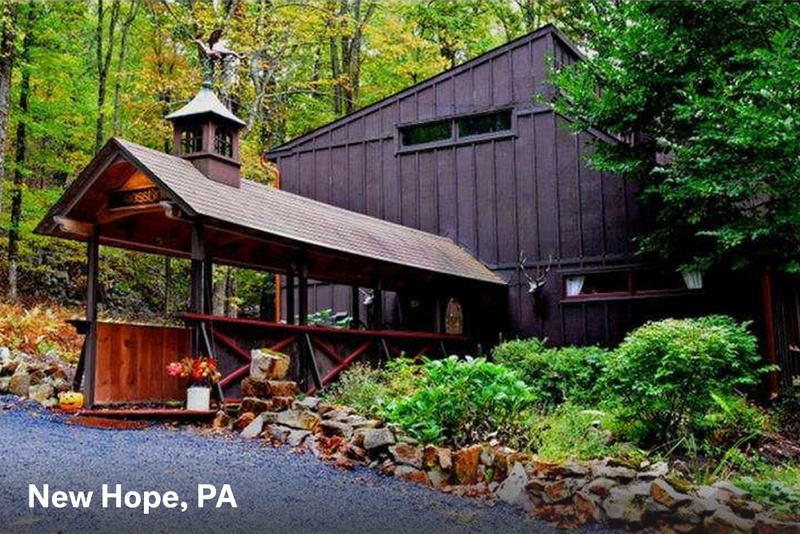 If you’re the type of person who never quite got over the ending of Mad Men, pack up your best paisley caftans and claim this circa-1969 property as your own. 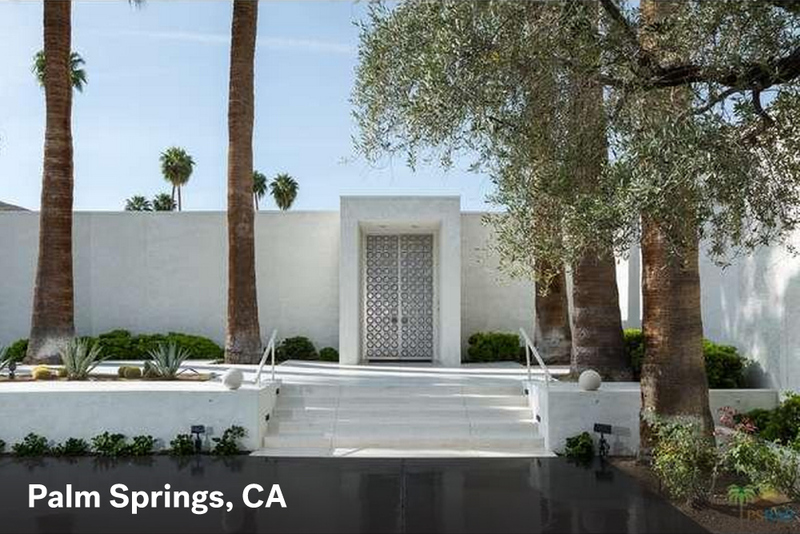 Widely considered to be one of Palm Springs’ most architecturally significant estates, the home was designed for a relative of cosmetics giant Max Factor. It is the epitome of late Mid-Century glamour from the moment you cross the black driveway, climb the white stairs, and enter the spectacular 10-foot-high aluminum-clad double doors. The black, white, and silver theme carries through to the interior, which is filled with vintage furnishings and art (the home comes fully furnished!). Pristine white walls, black granite fireplaces and counters, mirror-tile-covered walls, and statement wallpapers add up to one stunning setting. Stunned by these front door designs? Let us know which is your favorite is the comments below!